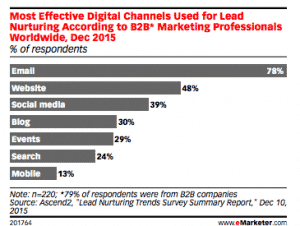 B2B Lead generation is the most common challenge faced by organizations all over the world. And the reasons are quite simple. B2C marketers can use aggressive marketing techniques, advertising and promotional offers to lure customers to buy their products or services. Their accessibility to the customers is much higher than that of a B2B business organization. On the other hand, B2B companies need to reach out to the top level decision makers such as CEOs, CFOs, CMOs, CIOs and many others, which is not quite easy. They are busy people and you need a very subtle and effective strategy to actually park your products or solutions or services in their minds. The most important doctrine for quality lead generation is to do a bit of everything rather than completely focusing on a single strategy, because every single drop makes a mighty ocean. Here are few strategies that may give you the desired results when it comes to B2B Marketing. When it comes to use of social media in professional fronts, people generally tend to only focus on LinkedIn. 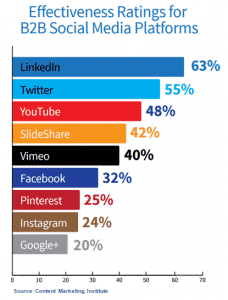 While LinkedIn has emerged as one of the most effective B2B social media platforms, Twitter, YouTube, Slideshare, Vimeo, Facebook, Pinterest, Instagram and Google+ too have been used effectively by marketers. Now some of these names might appear to you to be digital circles for family and friends, which is not the case. You cannot rule out the possibility of one of your potential customers unconsciously or consciously waiting to see a product/ service similar to yours on Facebook. This is why, leave no platform to market your offerings as it can payoff anytime. ‘Content is the king’. Investing into content development can be one of the best strategies you can think of. It can be used to create a strong link between your brand and your prospects. All you have to do is read the pulse of the market and feed them with engaging and useful content. For instance, if you are a provider of cyber security solutions, an article explaining the latest threats in the cyber world can help you attract greater traffic to your website and may even get you quality leads. Now, creating the content isn’t the end of the process. Your content strategy may completely fail if you do not promote the same on different platforms to attract the readership it deserves. You may promote different kinds of B2B content such as articles, white papers, case studies, free guides and more on your website as well as different social and professional circles on the Internet. You can also invite experts for guest blogging for your website. However, the biggest challenge with email marketing strategy is that you need to have a strong database of emails to implement it the best way. In case you do not have an email database, you can always buy it from a reliable database vendor who can give you a list of emails of the concerned decision makers specific to the industry or product/ service category you wish to position yourself in. If content is the king, SEO is the kingmaker. If you have an excellent SEO strategy in place, you can surely create the right amount of buzz around your brand. Optimizing the existing web pages, creating new web pages and updating the website with new and relevant content will help you increase the visibility of your brand. Adopt an inclusive approach and see the bigger picture rather than focusing extensively on just one area. According to a report by comScore, in 2015, 65 percent of the digital media was consumed on mobile devices. This number is further expected to grow at a rapid pace year on year. Clearly, marketers must optimize emails, content and web pages for better readability on mobile devices. Also, responsive designs make for a better user experience which must also be given the due attention. With millions of businesses on the Internet looking to make their mark in their respective industries, SEM can be an effective way to carve out a special place for your brand in the heavily crowded marketplace. Using paid advertisements that appear on search engine results increases your chances of success. PPC allows you to reach your target market swiftly as you get more control on the reachability of your ads and content. Many people believe that PPC is a wasteful expenditure which is not completely true. If you do not plan your PPC spend meticulously, you might put a dent in your pockets. When investing in PPC you must start slow and increase your budget when you see the desired results coming. Organizing networking events and conferences is a great strategy as it attracts the real prospects that are interested in your offerings and have a mood to purchase. Though an event may cost you a bomb, its effectiveness in generating high quality leads is indisputable. The only two conditions in which events may fail are when you ‘plan to fail’ or ‘fail to plan. With careful planning and well executed event strategy, success is assured.